OK, does everyone remember this entry? Well, time has passed...and the leg is better. Not healed, but better. 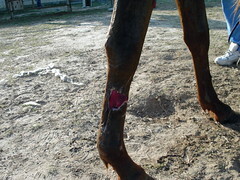 Here's the worst one..inside of the right foreleg. Still looks bad, but not nearly as bad as it *did*. 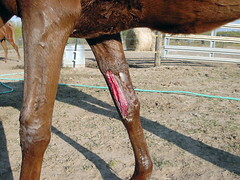 Outside of same leg - the wound is noticeably smaller and not oozing now. She's back in the pasture with the other mares, now - I got hay, and she decided she Had to Have some. *eg* They are - for the moment - leaving her alone. I am glad you, herself and erynne are all doing better!